Area27 isn’t just a race track, it’s like a resort for racers. It features onsite property, where drivers can store cars and live right next to the track. Thanks to the scenic drive to get to the location, this is a more welcome option than you might think. That’s in addition to being one of the best privately owned race tracks on the planet. The engineer’s contracted by Robbie Dickson’s Area27 created a custom blend of asphalt, designed to withstand the heat of the desert the track was built in. No racing simulator can come close to the feeling that you get when you open the throttle on your dream car, as you overtake your opponent off a straightaway cutting that perfect line into a corner. That excitement, not just of seeing a beautiful race in action, but of actually being there, isn’t as hard to capture as you think. 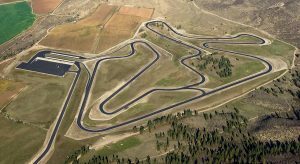 Area27, a Formula 1 style track in scenic Okanagan, offers Canadians a convenient getaway for an incredible experience. “You always want too many things. But really, it should give you the feeling you’re going somewhere,” says Jacques Villeneuve. He has walked the 4.9 kilometer layout of Area27 many times. He says you have to survey every mile, getting a feel for the land, the gradations. Racing, and the art of constructing a track, is tedious work with an incredible payoff. Fans understand the adrenaline rush, but the monotony that goes on behind the scenes, the diligence with which every bit of planning is done, is often lost in translation. Area27 is made up of 16 turns and corners that are designed to challenge drivers, teach them how to corner at high speeds, and test a driver’s will for top times. Some, like turn 14, present a particularly unexpected challenge quite suddenly. By the time you’re hitting the sixteenth and final turn, you’ve weaved through some incredible countryside and taken a variety of complex corners that test your ego as much as your driving ability. You’ll get better times every time you hit the track, which was a major goal of the track to begin with. In fact, Academy 27 is a driving school that track members can use to get better at the art of racing. Taught by Canadian Motorsport Hall of Famer Richard Spenard, the course takes drivers meticulously through each turn to learn how to drive with efficiency. The new hook for racing track developers is to make a track day more than a day, and to try and develop a lifestyle around racing. That was a major reason Robbie Dickson became involved with the Area27 project. As an investor, the project piqued his curiosities because it offered a gathering place for like-minded people. When you own a track car, you want to race it. It’s not always easy to do that on the street, so building a track gave Dickson and other enthusiasts a place to gather. On the site, you can see videos of Dickson lapping the track in his own stunning McLaren 675 LT Spider (a limited production car, only 500 were ever made), to show off how the track handles. Members have access to an exclusive getaway, with private lounges and property right on the track. A day spa and pro shop offer the full experience, with a restaurant on-site serving food all day. More than a track day, Area27 offers a track lifestyle to Western Canada.